Wind chill is a phenomenon common to anyone who has ever lived in a cold environment. When the ambient air temperature is substantially colder than the temperature of your body, heat will transfer from your body to the surrounding air. If there is no breeze to move air past your body, the air molecules immediately surrounding your body will begin to warm up as they absorb heat from your body, which will then decrease the rate of heat loss. However, if there is even a slight breeze of air moving past your body, your body will come into contact with more cool (unheated) air molecules than it would otherwise, causing a greater rate of heat loss. Thus, your perception of the surrounding temperature will be cooler than if there were no breeze. We may exploit this principle to measure mass flow rate, by placing a heated object in the midst of a fluid flowstream, and measuring how much heat the flowing fluid convects away from the heated object. The “wind chill” experienced by that heated object is a function of true mass flow rate (and not just volumetric flow rate) because the mechanism of heat loss is the rate at which fluid molecules contact the heated object, with each of those molecules having a definite mass. The simplest form of thermal mass flowmeter is the hot-wire anemometer, used to measure air speed. This flowmeter consists of a metal wire through which an electric current passes to heat it up. An electric circuit monitors the resistance of this wire (which is directly proportional to wire temperature because most metals have a definite temperature coefficient of resistance). If air speed past the wire increases, more heat will be drawn away from the wire and cause its temperature to drop. The circuit senses this temperature change and compensates by increasing current through the wire to bring its temperature back up to setpoint. The amount of electrical power required to maintain the hot wire at a constant elevated temperature is a direct function of mass air flow rate past the wire. Most mass air flow sensors used in automotive engine control applications employ this principle. It is important for engine control computers to measure mass air flow and not just volumetric air flow because it is important to maintain proper air/fuel ratio even if the air density changes due to changes in altitude. In other words, the computer needs to know how many air molecules are entering the engine per second in order to properly meter the correct amount of fuel into the engine for complete and efficient combustion. The “hot wire” mass air flow sensor is simple and inexpensive to produce in quantity, which is why it finds common use in automotive applications. Industrial thermal mass flowmeters usually consist of a specially designed “flowtube” with two temperature sensors inside: one that is heated and one that is unheated. The heated sensor acts as the mass flow sensor (cooling down as flow rate increases) while the unheated sensor serves to compensate for the “ambient” temperature of the process fluid. An important factor in the calibration of a thermal mass flowmeter is the specific heat of the process fluid. “Specific heat” is a measure of the amount of heat energy needed to change the temperature of a standard quantity of substance by some specified amount. Some substances have much greater specific heat values than others, meaning those substances have the ability to absorb (or release) a lot of heat energy without experiencing a great temperature change. Fluids with high specific heat values make good coolants, because they are able to remove much heat energy from hot objects without experiencing great increases in temperature themselves. Since thermal mass flowmeters work on the principle of convective cooling, this means a fluid having a high specific heat value will elicit a greater response from a thermal mass flowmeter than the exact same mass flow rate of a fluid having a lesser specific heat value (i.e. a fluid that is not as good of a coolant). This means we must know the specific heat value of whatever fluid we plan to measure with a thermal mass flowmeter, and we must be assured its specific heat value will remain constant. 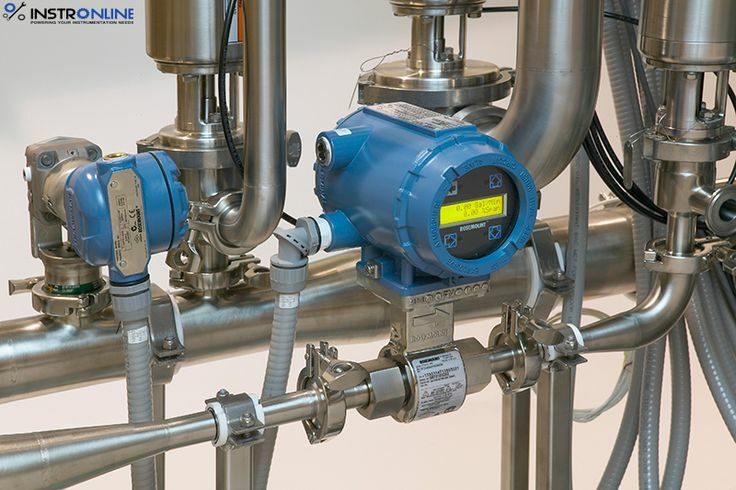 For this reason, thermal mass flowmeters are not suitable for measuring the flow rates of fluid streams whose chemical composition is likely to change over time. This limitation is analogous to that of a pressure sensor used to hydrostatically measure the level of liquid in a vessel: in order for this level-measurement technique to be accurate, we must know the density of the liquid and also be assured that density will be constant over time. Thermal mass flowmeters are simple and reliable instruments. While not as accurate or tolerant of piping disturbances as Coriolis mass flowmeters, they are far less expensive. Perhaps the greatest disadvantage of thermal mass flowmeters is their sensitivity to changes in the specific heat of the process fluid. This makes the calibration of any thermal mass flowmeter specific for one composition of fluid only. In some applications such as automotive engine intake air flow, where the fluid composition is constant, this limitation is not a factor. In many industrial applications, however, this limitation is severe enough to prohibit the use of thermal mass flowmeters. Industrial applications for thermal mass flowmeters include natural gas flow measurement (non-custody transfer), and the measurement of purified gas flows (oxygen, hydrogen, nitrogen) where the composition is known to be very stable. Another (potential) limitation of thermal mass flowmeters is the sensitivity of some designs to changes in flow regime. Since the measurement principle is based on heat transfer by fluid convection, any factor influencing the convective heat-transfer efficiency will translate into a perceived difference in mass flow rate. It is a well-known fact in fluid mechanics that turbulent flows are more efficient at convecting heat than laminar flows, because the “stratified” nature of a laminar flowstream impedes heat transfer across the fluid width. In some thermal flowmeter designs, the walls of a heated metal tube serve as the “hot” element cooled by the fluid, and the difference between the rate of heat transferred by a laminar flowstream from the walls of a heated tube versus a turbulent flowstream can be great. Therefore, a change in flow regime (from turbulent to laminar, and vice-versa) will cause a calibration shift for this design of thermal mass flowmeter.